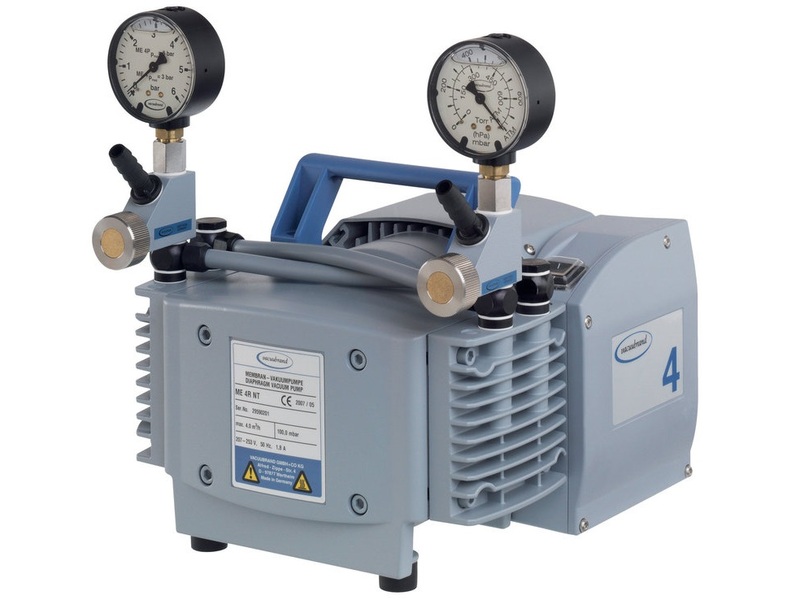 Laboratory vacuum pumps are available in a great variety of technologies in order to satisfy specific laboratory applications. Dry (oil-free) diaphragm pumps can reach down to about 1 Torr and can be designed for exceptional chemical resistance. Laboratory Vacuum Pumps – Vacuubrand, Inc. The roughing pump (often diaphragm or rotary vane) brings the pressures from atmospheric conditions to the range of 1 Torr or 0.1 Torr; the turbomolecular pump picks up from there to create the deeper vacuum. Oil-free and particle free diaphragm pumps are usually preferred for those who need a roughing (sometimes called fore pump or backing pump) for small and middle sized turbomolecular pumps, because some diaphragm pumps can provide service intervals that match the very long service intervals of turbomolecular pumps. The level of vacuum needed for each of the applications noted earlier differs across a wide range. Many lab applications are accomplished in the “rough vacuum” range, down to about 1 Torr or 29.98 in. Hg. (gauge). Processes that operate in this range include filtration, aspiration, rotary evaporation, centrifugal concentration, gel drying, vacuum oven drying, and solid-phase extraction. Such applications are best served with diaphragm pumps; the vacuum is in the right range and the operations are clean (no oil is needed), low maintenance, and can be made very chemical resistant, if needed. Vacuum pumps are often integrated into other instruments and equipment as OEM (original equipment manufacturer) components. Such applications include gas sampling (e.g., for environmental testing or process monitoring), laser etching equipment in semiconductor manufacture, and test chamber evacuation in analytical instruments to ensure accurate results. They are used to evacuate test chambers and eliminate the influence of environmental conditions. It is essential to consider your application requirements in order to choose the vacuum technology that is best suited to your laboratory and process needs. Start by defining the process for which vacuum will be used. Then define the level of vacuum and pumping speed needed. Finally consider chemical resistance, control requirements, maintenance intervals and environmental concerns (e.g., energy use, waste vapor capture) to determine the right pump. These considerations will help narrow down which pumps will accommodate your applications and achieve the lowest lifetime cost of ownership. Then talk with your preferred vendor to avoid a mistake that can compromise your samples or process, or leave you with too much or too little capacity from your pump. Laboratory Vacuum Pumps Nearly every field of science utilizes vacuum for one of a variety of applications, from sample preparation to liquid transfer or separation to drying or analysis.